Tucked on a barrier reef island, off the coast of Vero Beach, Florida, lies Orchid Island Golf and Country Club. Originally designed by championship golfer Arnold Palmer, Orchid Island’s course features eighteen-holes of immaculate greens, tee boxes and fairways. According to superintendent, Matthew Boyd, “Orchid Island is an atypical environment.” It’s in a microclimate all of it’s own, with sandy soils and an ever present sea wind that keeps the soil dry. It makes nurturing the course a challenge but one Boyd takes pleasure in. “Holganix Golf helps build up my soil chemistry,” explains Boyd, something that’s crucial for a course like Orchid Island. Over all, Holganix Golf helped Boyd improve rooting, CEC levels and carbon to nitrogen ratio. Initially, he also saw improved playability due to increased consistency on his greens, and less disease than years past (although he admits that it’s hard to quantify reductions in disease due to variability in past years). Perhaps the easiest way to sum up Boyd’s superintendent style is data enthusiastic. He constantly monitors the course’s progress and has teamed up with an agronomist to better research and customize his agronomic program. When it comes to Holganix Golf, the thing that blew Boyd away were his soil analysis results which were taken one year after incorporating the Holganix program along with other various organic profile amendments. Included in the data summary were huge improvements to Cation Exchange Capacity (CEC) along with the soil organic carbon to nitrogen ratio. “We had steady improvements in soil health both before and after Holganix, especially with our CEC,” says Boyd. What does CEC mean? Think of it this way, the soil acts as a pantry/storehouse for all plant nutrients required by the plant. The soil’s ability to hold, maintain and release essential nutrients is Cation Exchange Capacity. 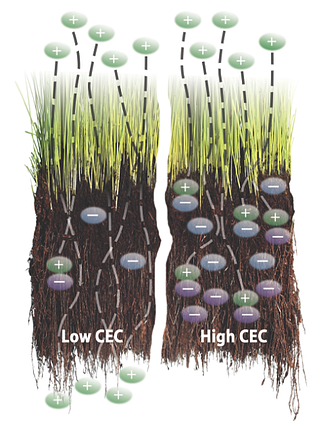 So, the greater the CEC, the more nutrients the soil can store and the happier the plant. From 2010 to 2013, Boyd utilized an alternative biological supplement and had a slight, yet steady increase in CEC achieving 4.81 M.E. in 2013. One year after incorporating Holganix into Orchid Island’s agronomic program, Boyd reports an increase in CECs from 4.81 in 2013, to 7.78 in 2015! That’s over a 60% increase! Also revealed in the soil test was a noticeable difference in organic matter. Overall, organic humus has increased from .42 to 2.8% – something that is crucial to the health of sand-based soils. Why is humus crucial to sandy soils? It increases the soils capacity to hold and store essential plant nutrients, decreases the potential for leaching, assists in the remediation of excess sodium and bicarbonate and provides a sustainable food source for both plants and beneficial soil biology. Yet, thatch has decreased. 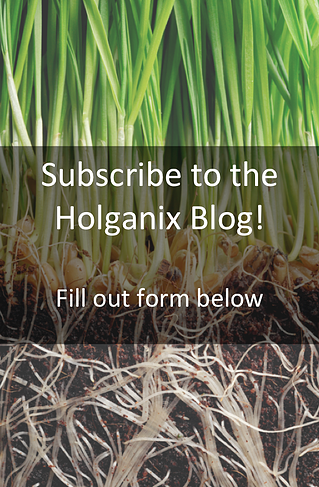 “That’s because the biology within Holganix was converting all of the old growth found in the organic matter into nutrients that are available to the plant,” explains Boyd. Overall, Boyd is excited by the progress he’s seen with Holganix Golf at Orchid Island. “Soil microbiology is going to be a hot topic in the next ten years and Holganix is right in the middle of it,” says Boyd. Overall, Holganix has enabled Easter to reduce his inputs, increase turf and root health and speed recovery time on the course, ultimately boosting sustainability. Broken Sound Country Club isn’t new to the world of sustainability. In fact, the exclusive, award winning country club was “the second golf facility in the US and the 14th in the world to be GEO certified - the sustainability assurance of the international non-profit Golf Environment Organization.” Broken Sound has also received Audubon Sanctuary Certification for both of their golf courses and established the first industrial composting project in Florida. In addition, Broken Sound has been recognized for recycling 95% of its solid waste. Broken Sound consists of two unique courses: The Old Course and The Club Course. The Old Course is the older of the two and contains sandy soils while The Club Course is newer and has denser soils. Because nutrients leach faster in sandy soils, “we make more frequent, lighter Holganix applications on our older course and apply Holganix heavier but less frequently on the newer course.” As a result, consistency and uniformity of turf health has improved on both courses. “We’ve also noticed a substantial reduction in the presence of disease pressure and have decreased our fungicide use by 30%. That’s less than I’ve EVER used in the past.” Furthermore, he has reduced his use of nitrogen fertilizers by 20%. Turf health isn’t the only benefit Easter has seen with Holganix. There have been huge improvement in root length, mass and density. In fact, Easter won the 2014 Holganix “Roots For You” Award for the longest turf roots in America. Because of his healthy roots, Easter has been able to reduce irrigation by 12-13%. “That’s substantial savings for a course like ours,” states Easter. When Easter received his soil analysis results this year, he was excited by data showing increases in CEC (Cation Exchange Capacity) and decreases in organic matter. Overall, since using Holganix on his new course, he’s seen a 17% increase in CEC on fairways and a 27% increase on greens. On his older course (features sandy soils), CEC increased on fairways and tees by 9%. Interestingly enough, when Easter treated his greens without Holganix on the older course he saw a 5% decrease in CEC. Cation Exchange Capacity is the ability of the soil to maintain and release nutrients to the plant. It’s the plant’s pantry. The larger the CEC, the more nutrients the pantry can hold and release to the plant. It’s a crucial measurement to plant health. The two main components of CEC are humus (the decomposed result of organic matter) and clay content. 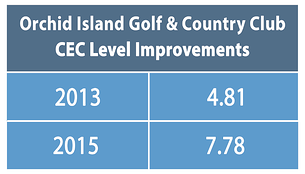 So, why did CEC increase so drastically on the newer course as compared to the old? That’s because it’s often harder to boost CEC in sandy soils, where nutrients easily leach and organic matter is limited. For sandy soils, increases in organic matter can be beneficial (leads to humus), however for courses with denser soil, decreases in organic matter can be a huge benefit. Why is organic matter a huge benefit? When organic matter degrades and is broken down by organisms, the end result is humus. Humus is a key ingredient in CEC, therefore, increase in humus often means an increase in CEC. That’s why, when Easter received test results showing a decrease in organic matter on The Club Course he was intrigued. Ultimately, organic matter dropped on fairways by 6.5%, 29.9% on greens and 29.2% on paspalum tees. The decrease in organic matter on the new course demonstrates that the living microorganisms in Holganix are hard at work, breaking down the organic matter, turning it into food sources for the plant and boosting CEC! Perhaps one of Easter’s favorite success stories with Holganix was in 2014, when Broken Sound underwent a renovation on their older course. What is Cation Exchange Capacity? Think of the soil as the pantry for plants, storing the necessary nutrients to feed the plant and ultimately boost plant health. The Cation Exchange Capacity (CEC) is the soil’s ability to maintain and release nutrients to the plant. So, the higher the CEC, the larger the pantry and the more “food” the soil has the ability to store and feed to the plant. So what exactly is the CEC and why is it so important to plant health? First, we have to start with a little high school chemistry instruction. Soil is composed of sand, silt, clay and organic matter. Clay and organic matter particles have a net negative charge. Like a magnet, these particles will attract positively charged particles and repel negatively charged particles. Elements (like nitrogen) with electrical charges are called ions. Negatively charged ions are anions while positively charged ions are cations. Cations (positively charged ions) cling on to clay and organic matter particles, and can be exchanged with other cations. “The total number of cations a soil can hold – or its total negative charge – is the soil’s cation exchange capacity. The higher the CEC, the higher the negative charge and the more cations that can be held” (Purdue University Cation Exchange Capacity Extension). Cations on the soil’s exchange sites resupply those lost through leaching or uptake by plant roots. “The higher the CEC, the more cations which can be supplied” to the plant, ultimately boosting plant health (the end of the soil chemistry story!). The exciting thing is that many golf course superintendents are finding a huge increase in their CEC following Holganix use. At Orchid Island Golf and Country Club in Vero Beach, Florida, Superintendent Matt Boyd is one of the superintendents reporting CEC improvements with Holganix. 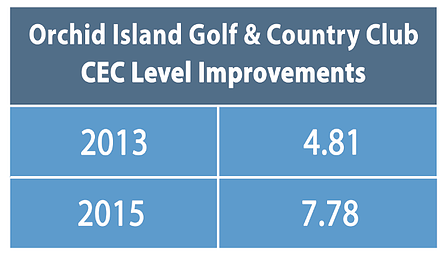 In 2013, Boyd recorded CEC levels of 4.81. One year after introducing Holganix to Orchid Island’s agronomic program, Boyd reports an increase in CECs from 4.81 in 2013, to 7.78 in 2015! 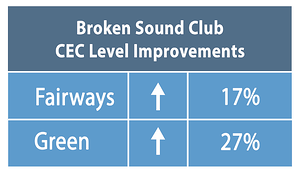 Shannon Easter, Director of Operations of Broken Sound Club in Boca Raton, Florida has also seen improvements in CEC. Over all, after using Holganix for one year, he’s seen a 17% increase in CEC on fairways and a 27% increase on greens. So how does Holganix increase CEC levels? As discussed previously, there are two soil ingredients contributing to CEC: clay content and humus. Both are negatively charged. Because Holganix stimulates digestion of organic matter, we increase humus levels and thereby increase CEC levels.